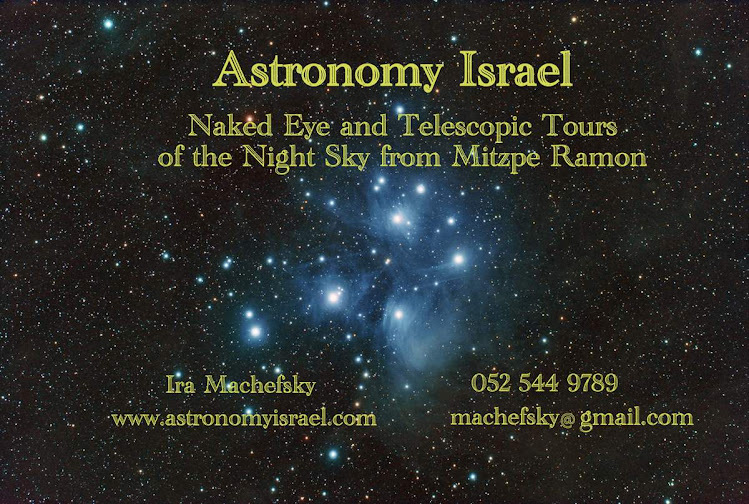 One of the things I like to do on a dark night is observe the Milky Way with the naked eye. This is the band of light that runs from the northwest, overhead and through the southeast this time of year around 8:30PM. It is the arms of our spiral galaxy seen edge on, home to our sun, solar system and about 1 billion to 4 billion other stars. 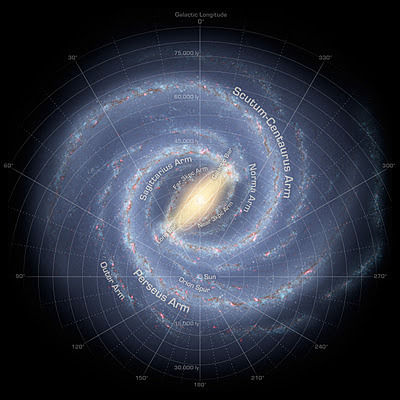 Imagine, if you will, our sun travelling along the arms of this great galaxy, orbiting the center, in a near-circular path that takes about 225 million years to complete a single orbit! We're travelling at about 486,000 MPH (miles per hour!) around the center of the galaxy, pulled along by the gravity of our sun as it orbits the center. In addition we're spinning on the earth's axis every 24 hours (speed varying by latitude) while the earth orbits the sun yearly at about 67,602 MPH. 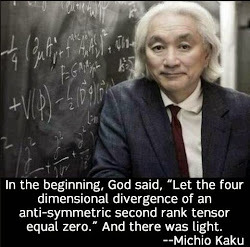 Throw in a few other motions like the precession of the equinoxes, the orbiting of the Milky Way around the center of gravity of our local galactic cluster, the orbiting of our local cluster around some Great Attractor, and things start to get literally dizzyingly complex. It's a relief to come back to earth and just ride the sun as it travels around our galaxy. To do this go out this time of year shortly after sunset. Find Sirius, the brightest star in the sky, just rising in the southeast. Stand with your back to Sirius and face northwest toward Vega, the brightest star in the constellation Lyra (The Lyre), just setting near the northwest horizon. The Milky Way (in a dark sky) will soar diagonally over head across the sky from southeast to northwest. You are now facing in the direction of the sun's orbit around the Milky Way, called the "Apex of the Sun's Way". (I've always loved that expression. Say it to yourself over and over again.) Behind you, you are leaving the stars of our galaxy at 486,000MPH (Called the Anapex of the Sun's Way, another expression I love). Before you you are approaching them at the same speed. Giddyap!! Come out for a star tour on a dark moon night and we can ride the galaxy together! 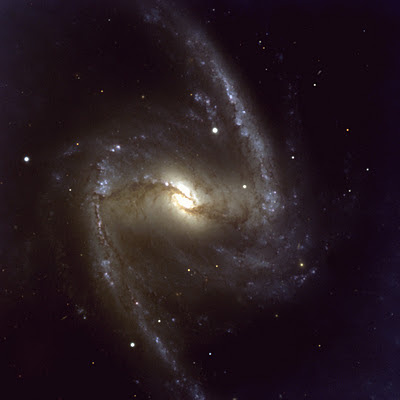 NGC 1365, the "Great Barred Spiral" in Fornax is 56 million light years away. The Milky Way is now thought to most closely resemble this galaxy. Wherein We Celebrate a Birthday!